The Painting: (1) From the beginning of God’s relationship to human beings, God has sought, step by step, and century by century, to get us to see the world, and ourselves in it, through His eyes, instead of through our own eyes. 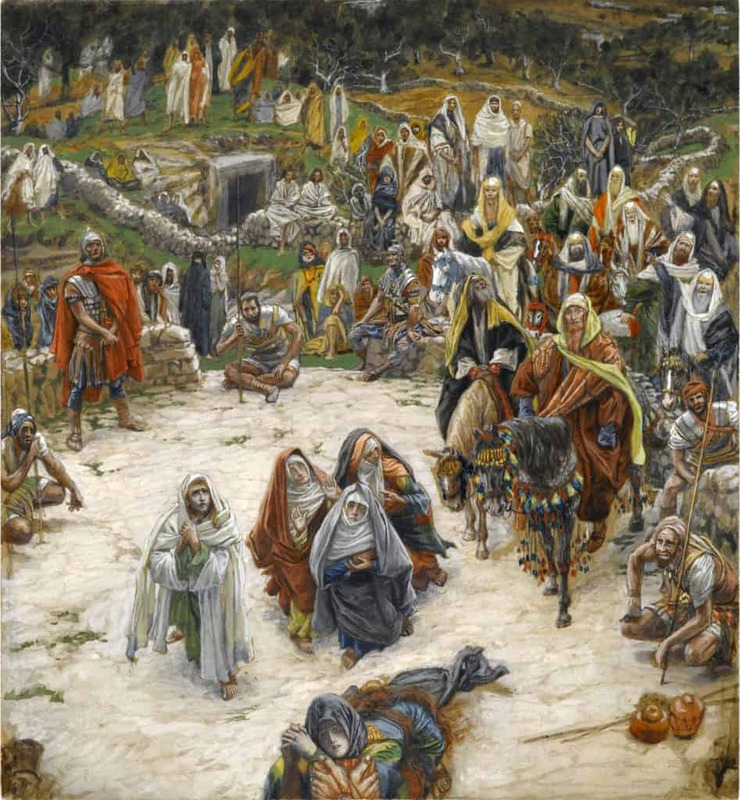 Notice how Tissot gets us to see through Jesus’ eyes as He hangs on the Cross. An astonishing and unexpected perspective! (2) By contrast, every painting of the Crucifixion makes us look at it through our eyes (from below, looking up) and, therefore, from our notoriously limited perspective. (3) There is nothing beautiful, at all, about looking at a brutalized, humiliated person pinned to a cross and left there to die in the presence of crowds mostly indifferent to Him. Tissot, contrarily, lets us see just how beautiful is the world that Jesus beholds from the Cross (colorful, richly diverse expressions of God’s creative power, a world given us as a Garden to enjoy not alone but with many others and of all kinds). God is proud of and loves what He created. (4) Our eyes looking at God make God ugly, while, in contrast, God’s eyes looking at us make us, and our world, beautiful. (5) Finally, notice those two men in white, sitting on the rock wall in front of the open tomb near the center of the painting. Let us suggest that they are the two Angels who stayed with Christ in the tomb. Jesus sees them there. The Angels are letting Him know that they will be there for Him, even in the Tomb, as years before they had been there for Him, and with His parents, at the beginning place, on the night that He was born near Bethlehem of Judea. John 3:19 And this is the verdict,n that the light came into the world, but people preferred darkness to light, because their works were evil. 20 For everyone who does wicked things hates the light and does not come toward the light, so that his works might not be exposed.o 21 But whoever lives the truth comes to the light, so that his works may be clearly seen as done in God. Up until now I have understood that darkness at noon, and then its continuance for three hours, as the Father’s allowing of our earthly light – the Sun (which would necessarily involve the Moon) – to be extinguished. What we had done to the Son, the Light of the World, I reasoned, God then allowed to happen to the lights of this world. It was God’ prerogative to allow this to happen, because “the light” is of God – light from Light. And in one Lord Jesus Christ, the Son of God, begotten from the Father, only-begotten, that is, from the substance of the Father, God from God, light from light, true God from true God, begotten not made, of one substance with the Father, through Whom all things came into being, things in heaven and things on earth…. That darkness over the world was fecund; inside of it was insight, and born from it was recognition. That darkness on Good Friday was about re-creation,  not un-creation. That darkness signaled an arrival, coming as a luminous Presence cloaked: the Father, Who heard the cry of his beloved Son … and came down. Much of our theological language – in hymns, in spiritual writing, in doctrine – reflects a conviction that needs more exploration, lest we misconstrue the truth, or at least significantly narrow its scope. That conviction is that Christ died for us, and for our salvation. Notice that Jesus did not say, as He could well have done: “All of you; listen to Me. I am doing this all for you. Into your hands I have handed over my very life. Do you understand what I have done for you?” No, not that. Or, as another example, Jesus did not say to those gathered below His cross something similar to what the dying Captain Miller in the movie Saving Private Ryan whispered to Private James Francis Ryan whom they had come to rescue: “Earn this!” No, not that. Finally, we did not hear Jesus say to those watching Him die: “You owe me bigtime. But pay Me back by paying this forward.” No, nothing like this. That Jesus said nothing like this should catch our attention. Jesus’ final word was not spoken to us, or for the sake of us. Jesus speaks His last word to His Father. We overlook how the passion and death of Christ was a profound labor of love done by Jesus for His Father, and a sustaining love given by the Father to His beloved Son, and of the Holy Spirit powerfully active as Love penetrating all aspects of this Mystery. The Trinity was at work expressing its own magnificent inner life in the Paschal Mystery, acting not primarily for a reason, but because God is LOVE: the mutual love of the divine Persons, which the ancient tradition calls the perichoresis. Love does what Love is … and not for a reason. Each year during Passion Week we recall, and own, that we rejected Jesus Christ, and that we wanted Him dead. We found Him simply too much to bear, as those early on in Nazareth also experienced Him. We did not want Him as our Lord to act for us and for our salvation, wanting instead something else, or someone else. But as 2 Timothy succinctly reminds: 13 If we are unfaithful, God remains faithful, for God cannot deny Himself. It might be especially valuable to think less of our sins this week and more about the divine glory that kindles in the darkness of Golgotha – the revelation of the inner life of the divine Trinity active and inexorable and effective. Doers of the Word: The “doing” of this week is really all about letting God reveal Himself to us as Trinity. As a result, the “doing” is about extra time we set aside to be inside the Passion accounts in the Gospels (normally it is best to stick to one Gospel, asking for the grace to see). Let us resolve to resist the “pull” we might feel to dwell on our sins, so that we can let God show Himself at work. Imagine us really seeing the Trinity at work throughout the Passion, and feeling joy when we do see. Remember that each of us contemplates the Passion from the perspective of the completely triumphant Christ, still bearing the marks of His passion, Who sits at the right hand of the Father in glory. This resurrection perspective does not “sanitize” the Passion of its ugliness, or obscure its stark reality, but it frames it properly. It appears that I have skipped over the sixth of the Seven Last Words of Christ – at John 19:30 *When Jesus had taken the wine, he said, “It is finished.” And bowing his head, he handed over the spirit.” But I touched on this “sixth” of the Words in my Meditation for the Fifth Week of Lent. But there is the practical fact that there are only six weeks Lent, and there are seven Last Words of Jesus. * Noon … three in the afternoon: literally, the sixth and ninth hours. See note on Mk 15:25.
b Ps 31:6; Acts 7:59.
f Ps 104:3; 144:5; Is 63:19. New American Bible, Revised Edition. (Washington, DC: The United States Conference of Catholic Bishops, 2011), Lk 23:44–47. I have understood this capacity given us by God to see the world as He made it to be, as He sees it in all its extraordinary richness and subtle elegance of order, as what the first gift of the Holy Spirit means: the gift of Wisdom. “Even as many were amazed at Him – / so marred were His features, / beyond that of mortals / His appearance, beyond that of human beings – … / He was spurned and avoided by men, / a man of suffering, knowing pain, / like one from whom you turn your face, / spurned, and we held Him in no esteem.” Isaiah 52:14. The is taken from the last of the Four Servant Songs found in Second Isaiah. The note in the New American Bible Revised Edition (NABRE) at Isaiah 42:1 reads: “Servant: three other passages have been popularly called “servant of the Lord” poems: 49:1–7; 50:4–11; 52:13–53:12. Whether the servant is an individual or a collectivity is not clear (e.g., contrast 49:3 with 49:5). More important is the description of the mission of the servant. In the early Church and throughout Christian tradition, these poems have been applied to Christ; cf. Mt 12:18–21. “Yet is was our pain that He bore, / our sufferings that He endured. / We thought of Him as stricken, / struck down by God and afflicted.” See at Isaiah 53:4 – a continuation of verses from the Fourth Song of the Servant. See John of the Cross, Spiritual Canticle, Stanza 5: “Pouring out a thousand graces, / He passed these groves in haste; / and having looked at them, / with His image alone, / clothed them in beauty.” St. John of the Cross, Spiritual Canticle, ICS Publications in Collected Works, translated by Kieran Kavanaugh, OCD and Otilio Rodriguez, OCD. I remember reading about how essential it is for the life and prospering of a newborn child that he or she be looked at with love from the moment his or her eyes first open. It is that loving gaze that “clothes the child in beauty”, letting that child know (before ever its cognitive capacity has come into play) that he or she is beloved, and wanted, and who is a source of joy to those looking at him or her. k Nm 23:19; Rom 3:3–4; 1 Cor 10:13; Ti 1:2. New American Bible, Revised Edition. (Washington, DC: The United States Conference of Catholic Bishops, 2011), 2 Ti 2:13. Ephrem the Syrian (b. c. 306; fl. 363–373). Syrian writer of commentaries and devotional hymns which are sometimes regarded as the greatest specimens of Christian poetry prior to Dante. Raymond E. Brown, in his famous and exhaustive work on the Passion, writes concerning Luke’s use of the “darkness” motif: “This rearrangement is undoubtedly a reflection of Luke’s penchant for a (logically) more orderly account (Luke 1:3) and shows an understanding that the two signs are of similar origin, reflecting God’s wrath. Luke wanted to concentrate the negative elements before the moment when Jesus would entrust his spirit into his Father’s hands (23:46). Everything in Luke that will follow that act of trust will be positive, acknowledging God’s benevolence.” Raymond E. Brown, The Death of the Messiah and 2: From Gethsemane to the Grave, a Commentary on the Passion Narratives in the Four Gospels, vol. 1 (New York; London: Yale University Press, 1994), 1038.
n 1:5, 9–11; 8:12; 9:5. New American Bible, Revised Edition. (Washington, DC: The United States Conference of Catholic Bishops, 2011), Jn 3:19–21. New American Bible, Revised Edition. (Washington, DC: The United States Conference of Catholic Bishops, 2011), Ge 1:1–5. This first “light” and “darkness” in Genesis 1:3-4 is clearly not the same thing as the second light: light of the Sun and Moon and the Stars. These latter lights were created after God had already clothed the Earth with vegetation (Genesis 1:14-16). I have understood that first Light as the establishment by God of a moral universe, or the securing of a foundational moral context that would be that in which God began to create everything else. At the beginning of Creation there was no ambiguity about the distinction between what was GOOD and what was not. But we must not overlook that God did not create evil or the Darkness; rather God distinguished Light from Darkness. The story from the pre-history section of Genesis, chapters 1-11, of Noah and his family and the Great Flood, is the most famous example of un-creation in the Bible. That story makes it clear that God “repented” that He had acted so drastically, and through the sign of the Bow (a rainbow), God promised humanity that un-creation would never be allowed. New American Bible, Revised Edition. (Washington, DC: The United States Conference of Catholic Bishops, 2011), Lk 23:47. New American Bible, Revised Edition. (Washington, DC: The United States Conference of Catholic Bishops, 2011), Mk 15:39. * God appears in the storm, which in Palestine comes from the west. The introduction to the theophany (Ps 18:8–9) is probably a description of a violent, hot, and dry east-wind storm. In the fall transition period from the rainless summer to the rainy winter such storms regularly precede the rains, cf. Ex 14:21–22. e Ps 97:3–4; 99:1; Jgs 5:4–5; Is 64:1; Heb 3:9–11. * Cherub: a winged creature, derived from myth, in the service of the deity (Gn 3:24; Ex 25:18–20; 37:6–9). Cherubim were the throne bearers of the deity (Ps 80:2; 99:1; 1 Kgs 6:23–28; 8:6–8). New American Bible, Revised Edition. (Washington, DC: The United States Conference of Catholic Bishops, 2011), Ps 18:8–12. From the Exsultet proclamation of the Easter Vigil. See: https://en.wikipedia.org/wiki/Exsultet. This reminds us about how we continue to suffer the effects of sin that binds us in the darkness of self-absorption, making our Redemption far more about me and what I require – for me, for my salvation – than about God, and about Who God is revealed to be as Trinity – a mutuality of divine Love. The divine LOVE has its “reasons” that our human reason is far too limited sufficiently to grasp. And we all have examples, even personal ones, that prove that some of the greatest acts of love that we know were unreasonable to a high degree (in the sense that no “reasonable” person could have guessed that a person would act so lovingly for another). The giving of forgiveness to someone who has badly damaged our life is completely “unreasonable”, but it is what Love does, and what divine Love commands of us to do. And, more fully explained by Basil Studer, in ed. Angelo Di Berardino and James Hoover, trans. Joseph T. Papa, Erik A. Koenke, and Eric E. Hewett, Encyclopedia of Ancient Christianity (Downers Grove, IL: IVP Academic; InterVarsity Press, 2014), 143.: PERICHORESIS (Gk. πειχώρησις). A term in Neoplatonic anthropology that was used to explain how the soul was intimately united to the body without being confused with it; by means of analogy, Gregory of Nazianzus applied it to the union of the two natures in Jesus Christ (Ep. 101; Or. 38,13). In this sense, it was reused by Byzantine authors who saw in the human composite an analogy of the incarnation (Lampe 1077ff.). Maximus the Confessor developed the concept to explain the unity of the person against the Monothelites (Bausenhart 173), using the example of a piece of iron placed in a fire, an example Origen had used to illustrate the union of the soul with the Logos. Following the thought of ps.-Cyril (PG 77, 1144B, 1163B), John of Damascus adopted the term perichoresis in an analogous sense for the inseparable, but not confused, union of the three divine persons (Expos. 8; 14; 49). Thanks to the Latin translation of John of Damascus’s Expositio made by Burgundio of Pisa, scholastic theology also received the idea under the Latin term circumincessio. See: http://www.usccb.org/prayer-and-worship/liturgical-year/easter/easter-proclamation-exsultet.cfm. Here just a few of its many lines of poetry.